The April 2009 challenge is hosted by Jenny from Jenny Bakes. She has chosen Abbe's Infamous Cheesecake as the challenge. For this month's Daring Baker's challenge, we were supposed to make cheesecake, but do something different and wonderful to it. 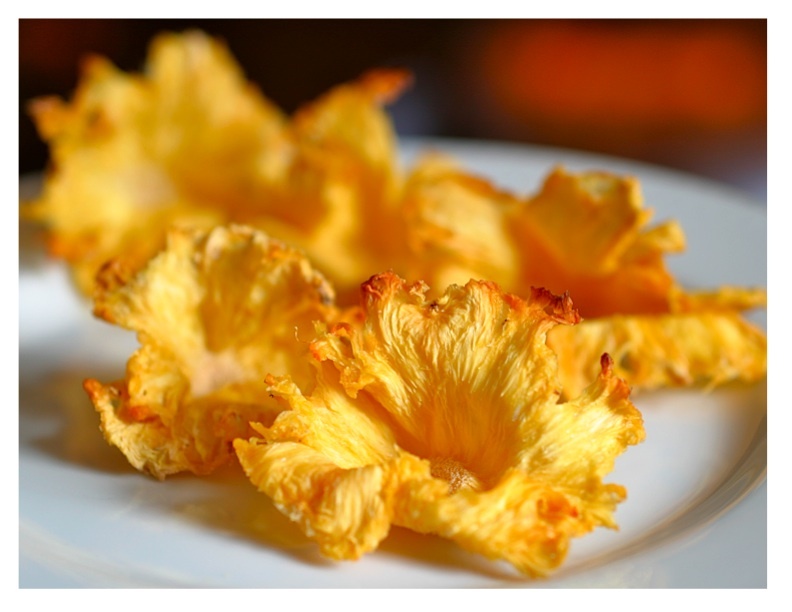 I've always wanted to make these pineapple flowers and thought about a roasted pineapple and rum topping I had made a while back for a cheesecake. So I put the two items together and it made a beautiful cheesecake. Jenny's recipe didn't call for sour cream or creme fraiche in the recipe, but I do believe it gives a cheesecake a special flavor and I always add it. Try to use a real vanilla bean for this. If you've never used real vanilla beans you won't believe the flavor difference. Buy good quality vanilla beans and store them in an airtight container in the pantry. Don't store them in the refrigerator. They should last about two years. I've even found real nice vanilla beans at Costco. If you can't find good quality vanilla beans where you live, you can order them from the Organic Vanilla Bean Company. Be sure to cook the cheesecake in a water bath. It really does prevent the top from cracking. I cook the cheesecake for an hour, shut off the oven, and leave the cheesecake in there for another hour. The top never cracks. For the Crust: Preheat oven to 350 degrees. Blend all ingredients in a 9" cheesecake pan and press the mixture over the bottom and about an inch up the sides. Bake until golden, about 12 minutes. Transfer to a rack and let cool. Carefully wrap outside of pan with 2 layers of heavy duty foil. Reduce oven temperature to 325 degrees. For the Filling: Using an electric mixer, beat cream cheese in large bowl until fluffy. Gradually beat in sugar. Split vanilla bean down the middle with a sharp paring knife. Scrape in seeds from vanilla bean and blend 1 minute. Beat in eggs 1 at a time and then beat in sour cream. Transfer filling to crust. Place cheesecake in roasting pan. Add enough hot water to the roasting pan so that the water comes up the side of the cheesecake pan about 1 inch. Bake cheesecake for one hour. Turn off oven and let cake cool in closed oven for one hour. Remove from water bath and refrigerate, uncovered, until cold, at least 6 hours or overnight. For Topping: Preheat oven to 400 degrees. 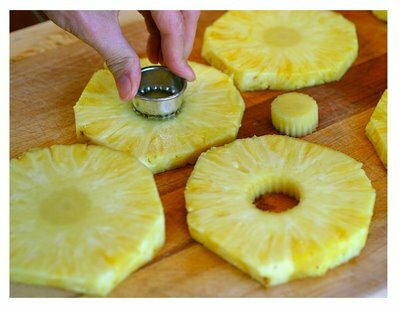 Place pineapple rings on large rimmed baking sheet. Boil remaining ingredients in a small saucepan for 3 minutes, stirring occasionally. Pour syrup over pineapple. Roast pineapple 12 minutes. Turn rings over and roast until tender and syrup thickens, turning rings every 5 minutes, about 20 minutes longer. Drain pineapple, reserving syrup. Cover top of cheesecake with some pineapple; stir remainder back into syrup. Serve cake, passing remaining pineapple in syrup separately. For the Flowers: Preheat oven to 225 degrees. Line two baking sheets with silpats or parchment paper. Peel pineapples. Using a small melon baller or the eye remover on a vegetable peeler, remove and discard eyes of pineapple. Slice pineapple very thinly, preferably with a mandoline. Place slices on baking sheets. Cook until tops look dried, about 30 minutes. Flip slices; cook for 30 minutes more. Flip slices again and cook another 30 minutes more until completely dried. Before the final flip, place a small ball of rolled up tin foil under the "flower" if you would like to mold it to be more of a flower shape. Refrigerate in an airtight container up to 3 days. tip: I sliced the first batch of pineapple for the flowers with a knife. They did not dry out enough, because they were not thin enough. I don't think you can get them properly thin with a knife. For my second batch, I tried slicing them with my mandoline and they were great. With the mandoline, I could get them very thin. tip: If you use a KitchenAid mixer and you don't know about the new beater blades which eliminate having to scrape down your bowl during mixing, I highly recommend them. They work great. My mouth is watering! 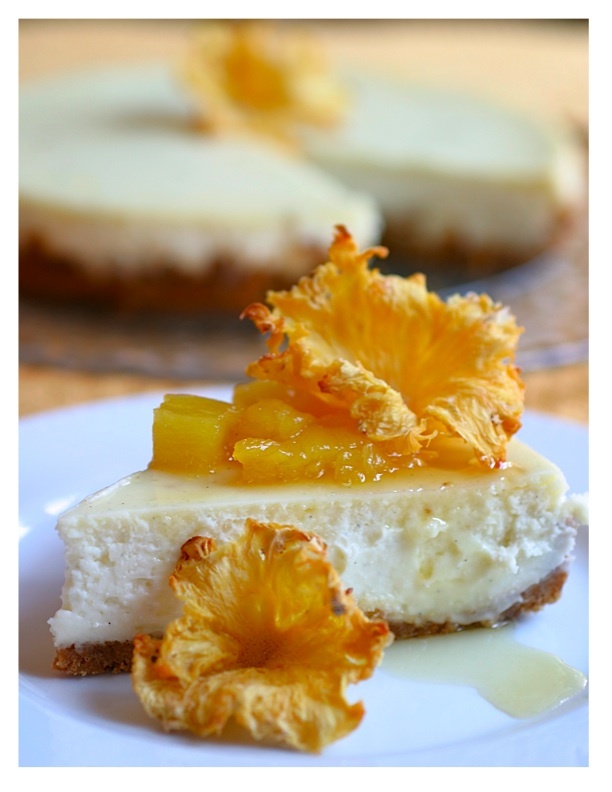 This combines two of my favorite foods: cheesecake and pineapple. Thank you thankyou. Looks Beautiful. All I can say is YUM! April 27, 2009 | Debbie M.
I thought this was real flowers when I first looked at it. I had to do a double take after I read your post, then I looked at it again! This is so beautiful Elaine, what a stunning detail for your cheesecake, I love it!! This looks delicious! I love the pineapple rum topping. this looks phenomenal! You are a fabulous cheesecake maker... its way harder than it seems! You did a great job. I love the flowers. Wow! Your cheesecake looks beautiful! 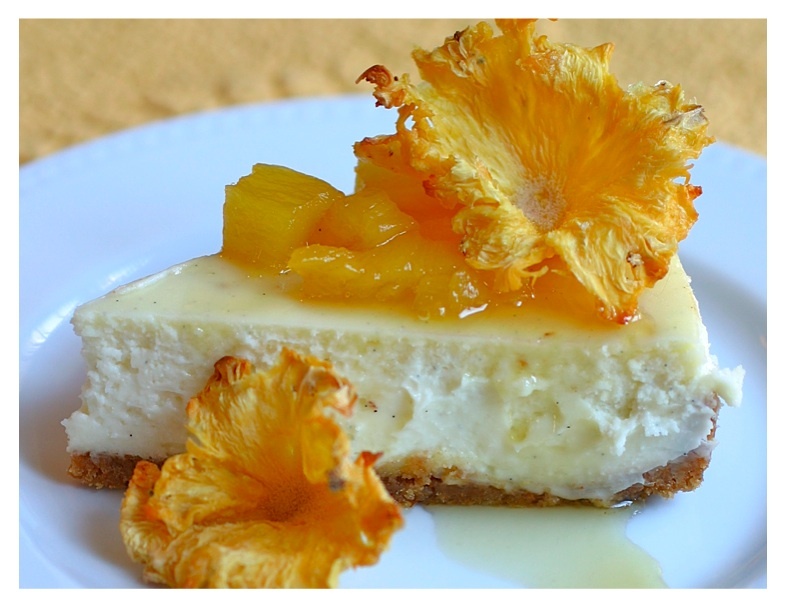 those pineapple flowers are beautiful and if it was half as good as the pineapple I had a few hours ago it would have been a great cheesecake. This is a work of art. The pineapple flowers are so beautiful. And, the cake looks amazing. i want the blades but is a lift mixer the kind with the metal lever that makes it go up and down? as in not a tilt? that looks wonderful. the pineapple flowers? too much. who makes those? (you not me). because i could never - would never. and why? because i am way too lazy. next - a little cheesecake crack is never a bad thing to me. but see? i am so like that. and last - it really does look beautiful and sounds delicious. Yum! This looks really fantastic. 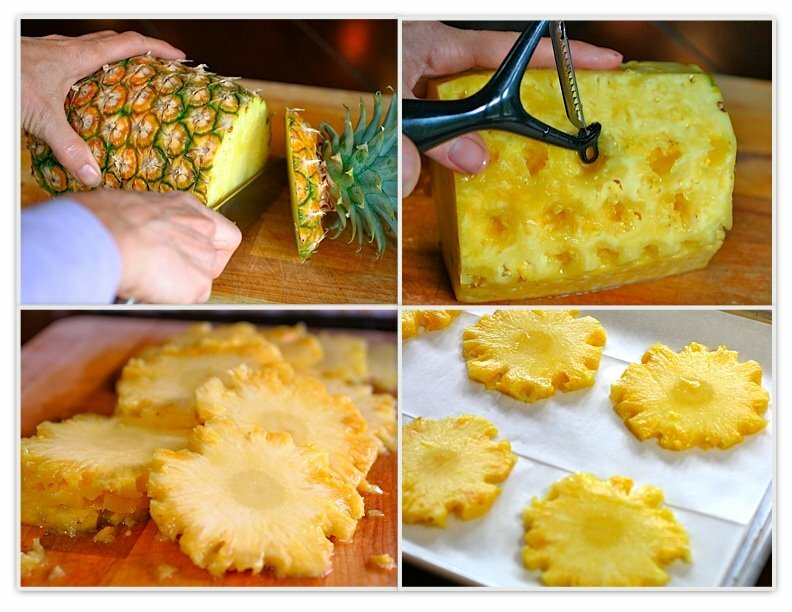 :) I love pineapple...what creative ways to use it! Mmmmmmmmmmmmm pineapple and rum... It sounds great. This looks so good! The roasted rum pineapples sounds delicious! cook eat FRET: The lift mixer is the large KitchenAid 600 professional series. It doesn't tilt, but has a handle that lowers and raises the bowl. That's what I have, because it has a large capacity. They also make the beater blades for the artisan series, which is the tilt type mixers. These blades are GREAT! Wow amazing flavours and well done. I really like what you had done with the pineapple slices. This looks delicious and beautiful. I cannot wait to try making the pineapple flowers. They are spectacular! oH my... the pineapple flowers are so goddamn beautiful! This looks great, but I'm confused- I thought the idea was to try Jenny's recipe, even if it isn't your "usual" recipe, and just flavor it as you wish. That cheesecake looks good! I like the rum and pineapple topping. This cake looks great, very simple and cool! everything you cook is also a work of art. Every single post on your blog is of such high quality that it becomes difficult to comment. But had to say something about those pineapple flowers - great job. This is so beautiful. What a centerpiece with the pineapple flowers. I didn't even know you could DO that. Thanks for being a part of this challenge. It is taking me a while to get to every post, so sorry for being delayed in commenting. Banana and pineapple pair well together and I simple adore banana cake. I happen to have some leftover crushed pineapple and some banana at home so what a great to use up my crushed pineapple and make one delicious cake. the food you prepare is not only beautiful but delicious. my mother, in an effort to made us more intrepid about food choices used to ALWAYS say 'try it, if it looks good chances are it tastes good'. she said it so often that we threatened to put this credo on her tombstone. her food presentations were truly works of art and thought I have not always found it to be true that if it looks good .... it was true with her food offerings and consistently true with the recipes I have borrowed from your site. thank you for an amazing website. Matt: Thank you so much! As for your question, I would think an almond crust would be delicious. Go fot it! wow those pineapple flowers are an amazing idea....just love it!! !